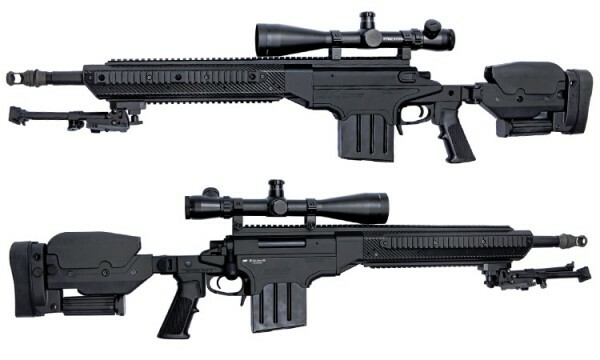 The Original ASW338LM weapons platform is engineered as a purpose built commercially-off-the-shelf (COTS) precision sniper rifle platform, the ASW338LM enables snipers to engage threats, out to 1500 meters. Ashbury International Group, has over 20 years of experience in systems integration and training for military units. AIG is currently a prime contractor for the Marines, Army, SOCOM and DHS. New stealth black 2nd generation Proline spring operated sniper. Featuring improved internals for reliable performance. Get the ultimate sniper experience with ASW338LM Black edition. Designed from original 3D drawings provided by Ashbury International Group Inc, this fully licensed high-end airsoft rifle looks and handles just like the real thing. 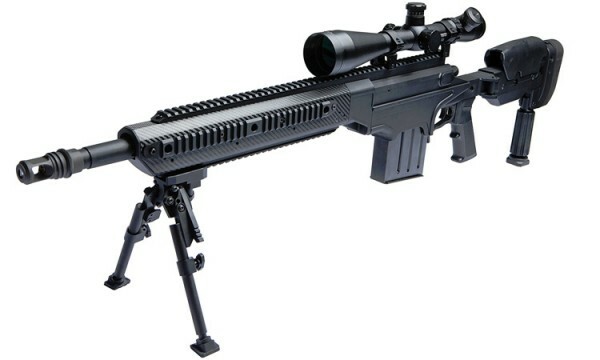 This precision airsoft gun features a monolithic full length top rail for scopes as well as a carbon-fiber look for-end with bottom rail and side rails that are co-bore aligned for mounting bi-pods and other tactical equipment. The ergonomic folding Push-button adjustable shoulder stock is custom fitted with adjustments for length of stock, cheek-piece height, and vertical recoil pad placement. It comes with a versatile adjustable field Mono-pod, and a mounted muzzle brake with a large 28mm external thread for quick mounting of a designated silencer (not included). The Rifle has a unique loading system which allows correct placement of the magazine for added realism. Delivered in hard-shell transport case with cut-out foam with additional room for bi-pod and silencer. An M90 spring is included in the case, if the rifle needs to be down-graded to comply with range rules. All in all the most advanced sniper rifle available on the Airsoft market today. Caution; due to the unique loading system, care must be taken to only use hard BBs, ask your local dealer for recommendations. Scope and bipod in image are not included. Can be purchased separately.